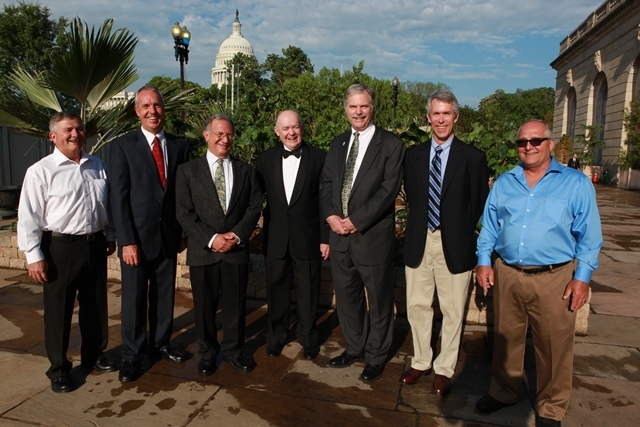 On May 9, 2013, we honored the stellar achievements of the 2013 NWA recipients at a ceremony in the U.S. Botanic Garden. Please click here for pictures of the event. The 2013 National Wetlands Award Winners with Environmental Law Institute President, John Cruden. From left: Jerry Panzner, Thomas Ries, Mark Silberstein, John Cruden, Robert Brooks, Doug Norris, and Steve Panzner. Thomas Ries has played an instrumental role in wetland restoration in southwest Florida for over 25 years. Tom, executive vice president at Scheda Ecological Associates, has been involved in over 80 habitat restoration and stormwater retrofit projects. His work has won numerous environmental awards, and resulted in the restoration of more than 2,400 acres of wetlands. Ohio landowners, brothers Steve and Jerry Panzner, have transformed their restored wetlands into a living laboratory that have been used by hundreds of elementary, undergraduate, and graduate students. In 2012, Steve and Jerry donated their land to the University of Akron to be used for wetlands education, research, and outreach. Landowner Robert Zorb has worked with federal, state, and local partners to restore his land in Washington and Idaho. Since the late 1980s, over 150,000 plants and scrubs have been planted on Bob’s land, and many acres of upland and riparian wetlands have been improved. At the age of 83, Bob continues to plant trees on his land. Pennsylvania State University Professor of Geography and Ecology Dr. Robert P. Brooks is a preeminent wetlands researcher. Rob’s work has resulted in more than 100 peer-reviewed articles, numerous book chapters, and more than 140 presentations. Rob has also trained 42 graduate students, furthering his contribution to wetlands conservation. Doug Norris has been at the forefront of wetlands protection and conservation in Minnesota for over 20 years. As Wetlands Program Coordinator for the Minnesota Department of Natural Resources, Doug has been a tireless advocate for wetlands in Minnesota, championing their protection through regulation, monitoring, mapping, and restoration. As the director of the Elkhorn Slough Foundation for 30 years, Mark Silberstein has worked tirelessly to protect, restore, and share the Elkhorn Slough. Under Mark’s guidance, the Foundation has brokered 48 land transactions, protecting nearly 4000 acres of land, and has restored more than 2000 acres of coastal and estuarine habitats. The National Wetlands Awards program is administered by the Environmental Law Institute and supported by the U.S. Environmental Protection Agency, U.S. Fish and Wildlife Service, Natural Resources Conservation Service, Federal Highway Administration, and USDA Forest Service. “In addition to providing vital habitat for fish and wildlife, wetlands help protect the health, safety and economies of communities across the nation. We are proud to help recognize and celebrate the outstanding people who have contributed so much to wetlands conservation for the benefit of all Americans,” said U.S. Fish and Wildlife Service Director Dan Ashe.